All purchases have our no questions asked 30-day return policy. If it doesn't work, we'll give your money back. Cleaning mildew & bathroom mold is a snap with this advanced formulation safe for cleaning travertine, marble tile, granite, quartz, all natural stone surfaces, porcelain and ceramic tile and grout. No hard scrubbing necessary to remove mold! 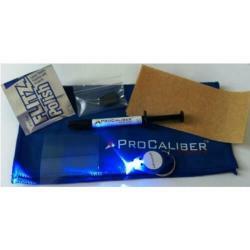 New gel clings to surface for deeper penetration and easier application on walls. Apply and watch mold disappear. Mildew stain removal made easy! Sprayer included. Contractors: Stone Care: MOLD & MILDEW REMOVER is amazing for power-washing and cleaning mold, mildew and pollution on outdoor stone cladding and concrete. I have tried every product out there to try and get rid of the orange & pink mildew stains between our marble bathroom shower tiles. I wish I could attach a before and after picture here because the results are insane! I sprayed, let it sit, and then scrubbed a little with a soft sponge (although not neccessary) and rinsed with water. My grout looks new again! 5 stars! It works!!! After going to a local hardware store and being chastised for installing marble in a shower, I feel it was the right decision. The salesman said it was a huge mistake and there are no products on the market that will clean marble in a shower stall. He then went on to say people always make that very expensive mistake, you can’t clean it! WRONG! I found your product and can’t thank you enough!! 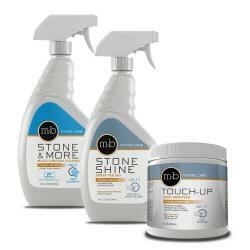 I must say after 5 years of looking for a good quality travertine tile cleaner and now finally found MB Stone Care. These products work wonders in and around my Master Bath room. We bought an existing house with marble shower tiles. I have tried everything over the past two years to clean the orange mold off our white grout on the shower floor! I've spent hours with my grout brush scrubbing but not getting the grout back to its white color - until now. I was leery of the price and shipping costs but in frustration bought it anyway and couldn't be more pleased. The product works just as indicated. Spray the gel on and wait for the yucky orange to disappear. Definitely recommend! I finally found the right product to clean our marble shower floor! It was hard to find something that would clean the mildew, without ruining the marble! I will be re-ordering soon. 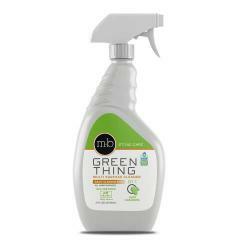 This is great for removing mold and mildew from shower tile and grout. Your website is a great source of knowledge on natural stone. Your products are excellent. They work great on my marble floors, counter tops and shower. Thanks. It works wonders on the white grout that yellowd after a few years. It's back to bright white. It doesn't damage the marble. Great product! We just remodeled using marble in the bathrooms. I was frantic when mildew appeared and could not find an appropriate product since all warned not to use on marble. I landed on this website and ordered and am so pleased! The mold and mildew remover works like a charm. Will be ordering regularly, every time I need to clean! This product really works! 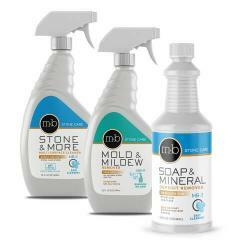 I have tried so many other products in stores for natural stone, but nothing came close to getting rid of the mold/mildew in our shower. 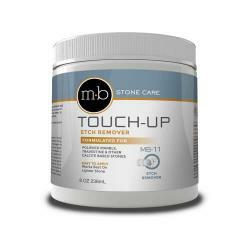 This product worked the very first time and with a little bit of scrubbing I was able to get rid of all the mildew. Now I just spray it on every couple of weeks to prevent the mildew from coming back. 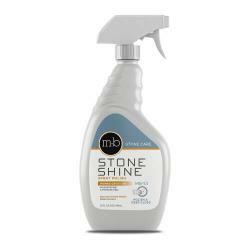 Great product that does exactly what it says and does not damage the stone or bleach out the grout. Was becoming disenchanted with my travertine tiled shower. The mold/mildew was building up quickly. But what the installer had suggested to use for cleaning was not working. I found your website and decided to try some of your products. I was amazed at how easy it works!!! Great product! This product is excellent. I wish it came in a larger bottle. The mold and mildew stain remover really works. It removed the mildew and did not harm the marble. I will buy more as needed. This product is great. We had remodeled out master bath in late 2009 with travertine tile and were told we could not use what we were using for the old porcelain tile. for 5 years we tried numerous products but none of them cleaned as well as StoneCare. Only issue is the fumes are very strong, if they can overcome that it would be a fabulous product. ########### Countertop Specialty comment: Thanks for your feedback! We are sensitive to the fumes issue, although, for this one product it is difficult to make it both effective and no odor. It is best to apply and let dwell for several minutes and then return to complete the cleaning. This product definitely works. 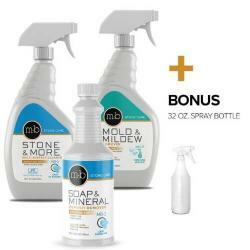 I have had no issues with mold or mildew since using this product. If you're having problems with mold, I recommend that you try this product. Reviewed before. Still enjoying product and still works well. Now has a stronger Clorox smell - either product has changed or this is a different product. ########## Countertop Specialty comment: Thanks for your feedback on this. We are very aware that product smell is important and do try to minimize it as much as possible. Of course, smell can be modified only so much depending on the required product formula. Glad to know you still enjoy using the product. 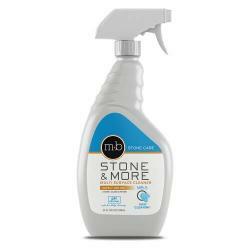 I purchased the Stone Care: Mold and Mildew Stain Remover, and let me just say…it’s fantastic! I’ve tried numerous other “marble safe” products to remove mildew spots from the grout lines in our shower, and NOTHING has worked… until now. I sprayed this product onto the shower floor, waited a couple of minutes, and then gently scrubbed grout lines with a toothbrush, and away went the mildew stains!! Thank you, thank you, thank you! I have made my fourth order of your products and will continue using them on my marble shower and kitchen counters. I have found your Mildew Stain Remover and Bath and Shower Cleaner to be the best on the market for their purposes. I have started spraying my shower after each use and see noticeable differences. After having a newly installed marble bathroom and experiencing etching 1 month later when the cleaning lady used vinegar cleaner, we have started exclusively using Countertop Specialty products and have been very happy. I love this product. It cleans very quickly. I just wish that it came in a larger refill size. Very helpful. The first time I ordered from this company I did not know what product to buy for my stone (Travertine). I called and left a message. They called me back within a day. They were very nice and extremely helpful. Copyright CountertopSpecialty.com. All Rights Reserved.